The troop gathers for a traditional group photo before leaving. 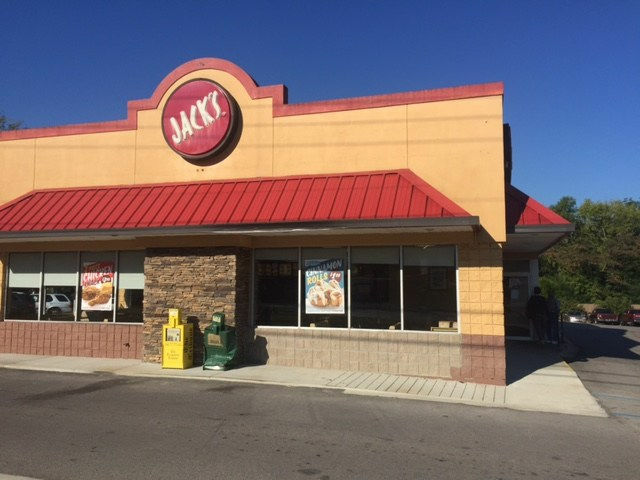 The troop met at 10:30 on Sunday morning to head north to Camp Sequoyah near Delta, Alabama. This is the troop's third time to attend the camp in which some of our troop leadership have deep roots. 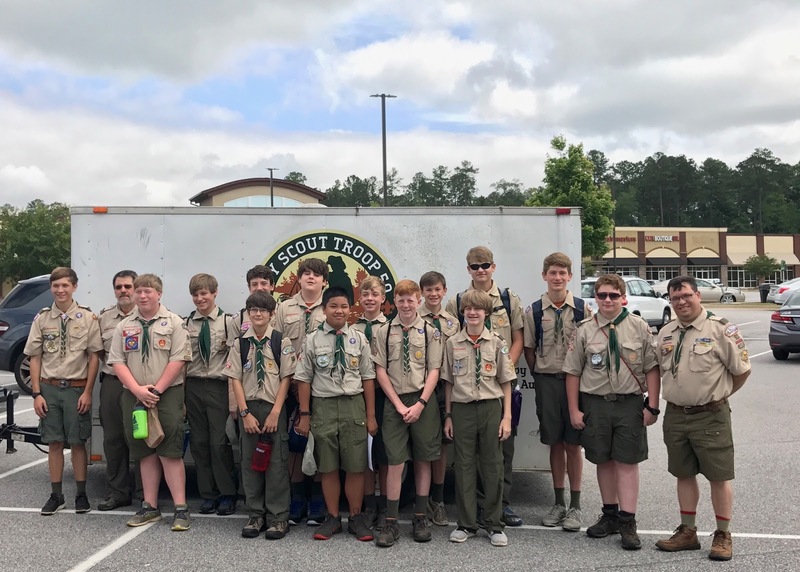 The troop met in the Publix parking lot and had a brief meeting before saying goodbye to their families for the week. 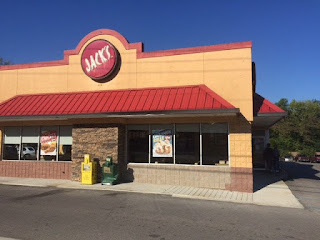 The trip to camp was uneventful and the only stop was for a quick lunch bite at Jack's in Wedowee. All scouts ate well and were eager to get settled into camp and get checkout complete so they can enjoy a week of camping. A special thanks goes to Assistant Scoutmasters Davis Baird and Clyde Wikle for taking time out of their day to drive scouts and tow the troop trailer. When we arrived at camp, we were greeted by our host who took us to our campsite, Bobcat's Den. Everyone was quite surprised to see another troop already setup and enjoying the camping experience. They had arrived from Florida the night before and were quite settled in. We didn't realize that we would be sharing a campsite with another troop. The other troop didn't realize this either. The camp staff didn't realize it either! This wouldn't have been an issue if there were enough tents. However, we were 4 tents short. Obviously something was wrong here. After some investigation, we learned that the council office had made a terrible clerical error. We are not unfamiliar with issues at the council office. It's not clear exactly what happened, but there was some confusion between our troop and the troop occupying Bobcat's Den. Our troop has 14 scouts and 3 leaders attending. Their troop had the same number. Both troops are out of council. We are Troop 50. The other troop said "We are Troop 52"! One of us was on the list and the other was not and mass confusion ensued. Apparently, someone thought we were the same unit! We were able to find another campsite (Cherokee Point) with enough tents for us so we could get park our trailer and start checking in. We quickly changed into swimsuits and headed towards check-in. Even though we had arrived early to avoid the lines, we were now deeply embedded in a massive lines for checking in. There was some doubt that we would be able to complete the swim tests because of how late it was getting, but we were able to complete them. We rushed back to camp to change into our Class A uniforms for dinner and arrived just in time. For dinner we enjoyed a pizza pasta bake, green beans, and garlic bread. Scouts seemed mostly impressed by their first meal at camp. After dinner we were able to finish up some paperwork to handle some other clerical errors related to merit badge scheduling and finish the setup of camp before heading to the opening campfire. At the opening campfire, we were introduced to the staff and were able to sing and dance a bit. We also had a devotion about happiness and how we should work to make others happy (instead of only doing things that make us happy). We learned that thinking of others first would bless us. We left the campfire in silence so we could reflect on the devotion and we headed back to Cherokee Point. The scouts finished off the night with a few card games, chess, and relaxing in hammocks. We had a small rain shower during the night and it was uneventful otherwise. The first day at camp was a little rough dealing with a variety of issues including troops being assigned to wrong campsites. We are optimistic this will improve and we will enjoy the rest of the week. Monday starts merit badge classes and the troop will have a recreational swim in the afternoon. After dinner will be Adventure Valley - the mud run. It will be a full day of learning, advancement, and fun! For more pictures from Camp Sequoyah Day 1, check our out troop photo album.